One of the earliest surprises when we first moved to Brussels was a flash of green and an unexpected silhouette against the sky. Before we came we talked a lot about what we might expect of Brussels and about how we should be prepared for surprises. But I can honestly say parakeets did not feature, even in our wildest imaginings. As a child I kept a budgerigar as a pet. Three years ago, when I first saw green wings shoot by the living-room window, I was carried back 50 years in time. Of course, the Brussels parakeets are larger than budgerigars, but in flight they have the same shape. The parakeets of Brussels became something we shared with visitors, and everyone was as amazed as we were, till my sister came. She was blasé about them. You can see them “all over” in London, she said. On several short visits to London since she told me that, I have looked out for London parakeets, but I’ve never seen them. In Brussels I see them almost weekly. There are at least two and possibly three nesting colonies in Forest Park, and one colony in the little round park at Place Guy d’Arrezo. I hear them high overhead squawking and chattering whenever I walk by. I also see them flying, and our garden in Uccle seems to get at least one fly-past every spring. In my imagination it’s a new generation scouting out the neighbourhood. So far they don’t seem to have found it attractive enough. But the Brussels parakeets have expanded far beyond whatever was their original territory. I’ve heard various stories about where they originated. They were domestic parakeets who escaped. They were pet-shop stock released by accident when the shop went bankrupt. Or they were freed deliberately from a private zoo because the owner thought Brussels needed a bit more colour. And I suppose the one doesn’t rule out the other — all these stories could be true. Where they immigrated from originally is also a moot point — mostly because I haven’t found any sure identity for them. Some sources claim they are rose-ringed parakeets (Psittacula krameri) from India or Africa. 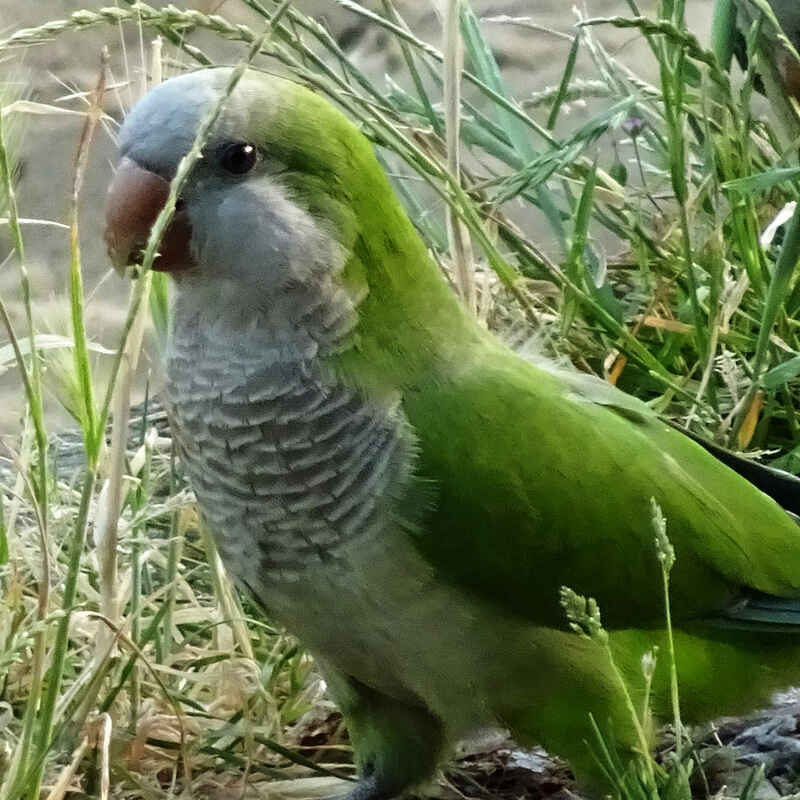 Others, with just as much certainty, identify them as monk parakeets (Myiopsitta monachus) from Argentina. 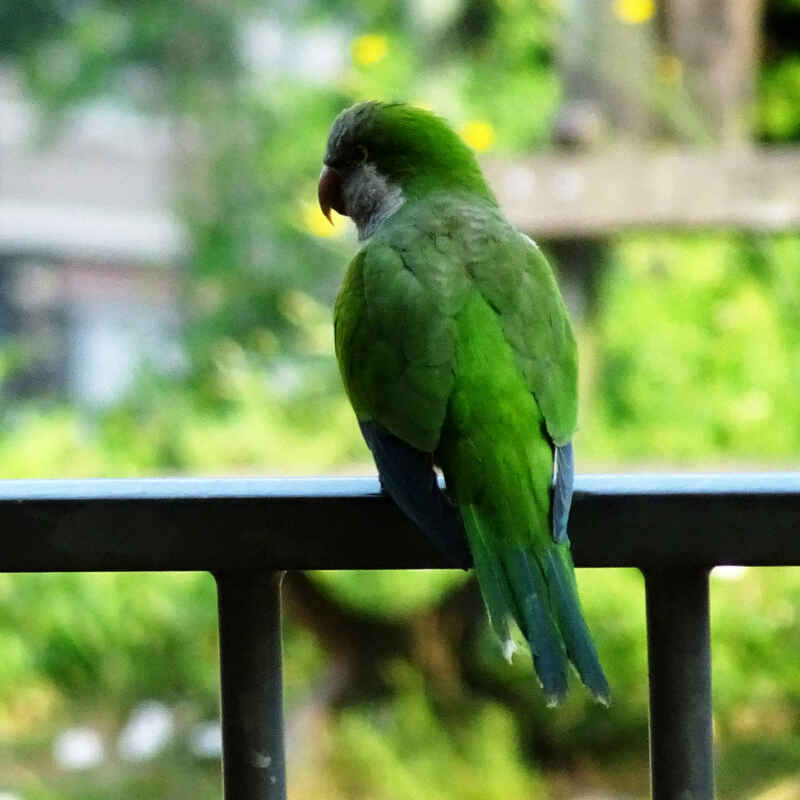 Personally, and working only from observations and pictures on Wikipedia, I go with the monk parakeet theory. Just because they seem to be the greener. 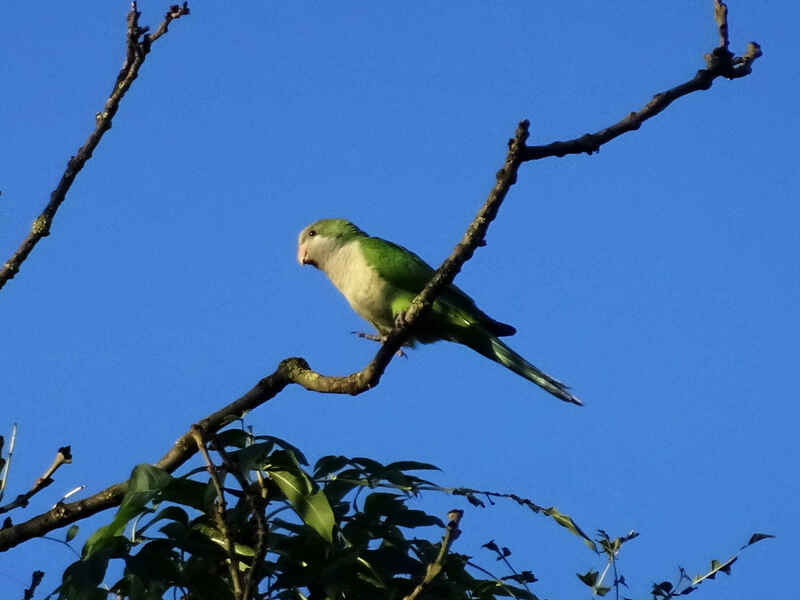 Do a search on the web (search term “Brussels parakeets”) and you’ll turn up a small selection of newspaper reports from 2010, 2015 and thereabouts reporting “Brussels parakeet population out of control” (The Bulletin.be, 2014) and “Brussels’ Parakeet Population Soars” (Wall Street Journal, 2010). Those, and various Youtube videos and blog posts, support what anyone could easily guess. The parakeets divide people. There are those who think the parakeets are an attractive addition to the native fauna. And there are those who can’t stand them and think of them as an invasive species. 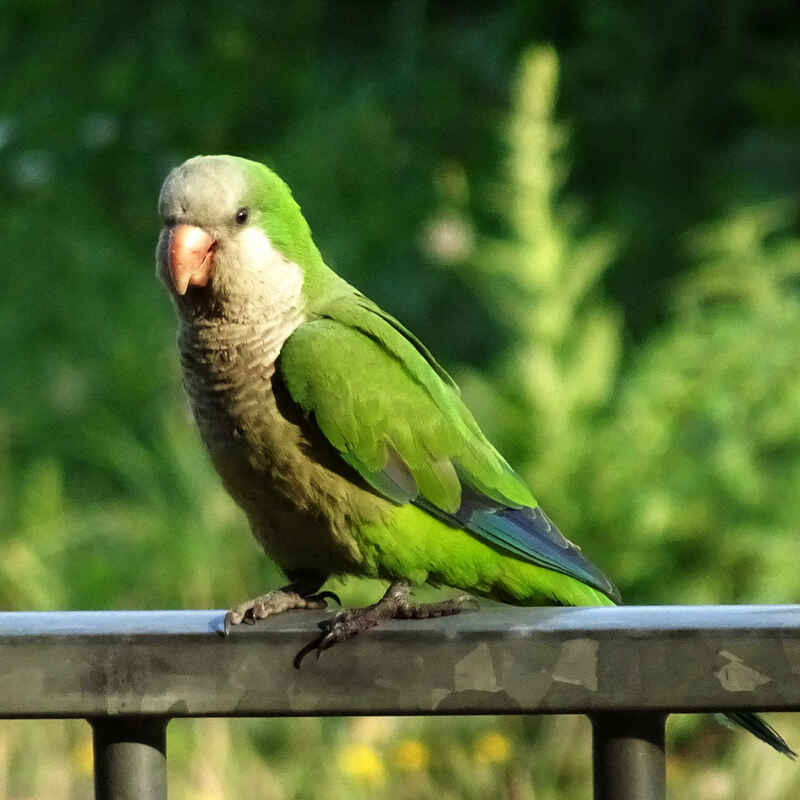 The first article mentioned above discusses the Brussels authorities having difficulties trying to control the parakeets. Apparently the city has tried shooting them, sterilising them and destroying their nests, all without success. The parakeets are not stupid and this may explain why, though both visible at a distance and audible when you walk under them, the parakeets are remarkably shy about getting too close to humans — or to cameras. I’ve been planning to write about them for months, but actually getting a decent photograph was surprisingly difficult. At present I don’t own a proper zoom lens, so for a parakeet portrait I need to get reasonably close. I tried creeping up on the flocks when they were picking over the ground with pigeons, but they saw me coming. Last winter, I tried throwing handfuls of seeds and grains out to entice them down. Pumpkin, sesame, sunflower, oats (OK, basically handfuls of muesli), but they were having none of it. The pigeons loved me though. I was almost driven to making some digital drawings based on the long-distance, out of focus pictures I did manage to take. However, patience is rewarded in the end. This summer I finally managed to snap a few half-decent pictures which I share with you here. Enjoy — and, visiting Brussels, see if you can do better yourself! 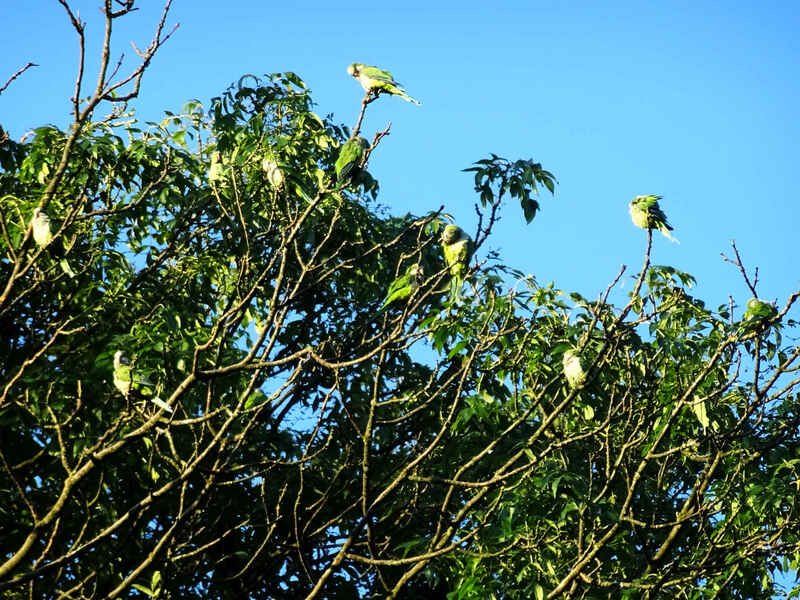 Or go and seek out your own urban parakeet colonies, because the more I research the more I seem to find. I’m currently reading about another member of the Psittaciformes family, The Lucky Galah. So it seemed a good moment to share this. I wrote it originally for Bladet, the magazine of the Swedish colony in Brussels. The summer it refers to is last year’s (2017). Here are three other of my blog posts that also appeared in Bladet.